Some of the best trips I have ever taken have been within the pages of a good book. Books have a gentle power to raise your spirit, open your mind, and touch your heart. There are few pleasures more sublime that starting a new book which holds the promise of a great escape into another world. Being an enthusiastic reader, with ambitions to one day write a book, I love going to hear established favourite authors doing readings and being interviewed. I love to hear how they write, where they write, what inspires them and how they started. Not surprisingly good writers often are great talkers. I have been enthralled by Alexander McCall Smith (wonderful raconteur), Melvyn Bragg (oh the intellect), Patrick Gale (who lives what seems like an idyllic life) and our own Maeve Binchey (master storyteller). These evenings have all been interesting, amusing and inspiring, not to mention a cheap night out. Dun Laoghaire is probably one of the best places in the country to live if you like books and writing. Dun Laoghaire Rathdown Library Service runs the wonderful Library Voices series of talks by writers, along with the annual ‘Mountains to Sea Dun Laoghaire Book Festival’. And down the road is Dalkey which now also holds an annual Book Festival. When I think of children and books I always think of Gaybo on the Late Late Toy Show who always began the book segment by saying that giving the gift of a book to a child is to give for life… how right he was. Santa always brings books to this house. Like most readers I also love a good bookshop. To wander around shelves crammed with wonderful characters, tales from all around the globe and from all periods of history including the future is truly magical. The air is heavy with possibilities. Libraries offer similar promise coupled with wonderfully eclectic noticeboards offering local courses and services. When my girls were younger the local library was a great way to pass the afternoon and again cost nothing. The only thing, associated with reading and books that I don’t really like is book clubs, which surprised me. I did join one for a while but it brought out the worst in me (she says honestly). I realised how much I don’t like being told what to do – as in ‘this is the book we are all reading this month.’ I cheated when it was my turn by suggesting books that I had already read so I could have a month off to read my own books. Whatever personality fault I have, meant that I couldn’t take the talking and debating the book seriously. I reverted to my teenage schoolgirl self, messing, making facetious remarks and disagreeing just for the sake of it. I decided to leave the club (although some of my best pals are in it), before I was asked to behave which would have been the ultimate humiliation. I suppose my ideal book club would be where each person would bring a good book they had read on the basis of ‘bring a book, take a book.’ But then again I do this with my bookish friends informally anyway. I have a rule which says that life is too short and too full of good books to spend time reading a book you are not enjoying. You know that feeling when you go to bed and remember the book you are reading is not doing it for you. That’s a sign to abandon book and pick up another. It’s the reverse response to a good book – which you dread finishing, because you don’t want it to end. Finally – books are meant to be shared. Don’t clutter your home by hanging onto every book you have ever read. Swop them, donate them to your local charity shop or take them to a second hand bookshop where you will get credit you can use to get more! I am about to start the latest book by one of my favourite authors (Dun Laoghaire Library Service take note) – The Legacy of Hartlepool Hall by Paul Torday. Paul’s first novel Salmon Fishing in the Yemen remains one of my all time favourites and it has recently been made into a movie which will be released here just after Easter. I have seen it and it’s a gem. I will post a review in due course! So if you have time today pop by your local bookstore and pick up a book – it’s World Book Day and you’re worth it! 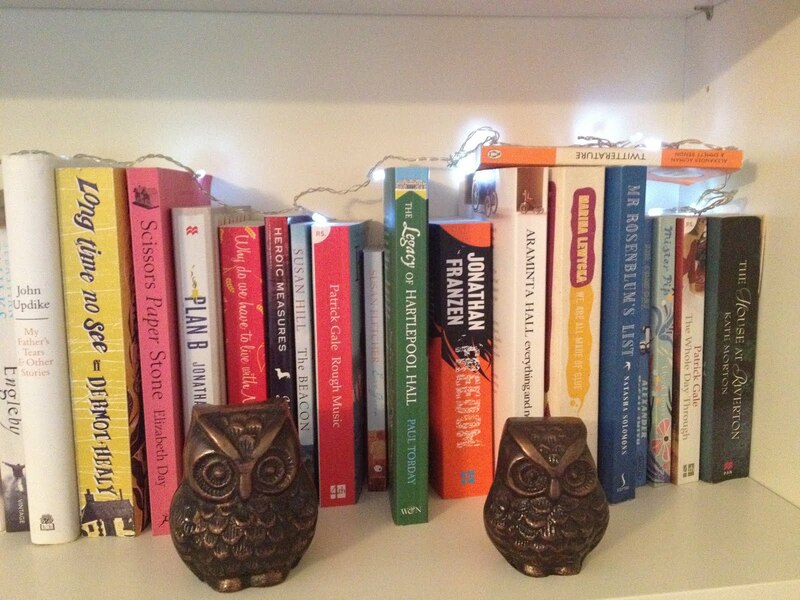 Photo of my ‘To Be Read’ book shelf where my books are minded by my owls! WHAT IT MEANS TO BE IRISH…. Fabulous tribute to books and bookworms everywhere! I also have a motto: “Life is too short for bad books!” Though I have found that sometimes a book that I can't finish at one point in my life becomes a can't-put-down-read at another point. Thanks again for this trinute! Happy Book Day! If someone really wants me to read their book – then they'll write it using words and structures I understand. This was my motto when I was working, and had to read books on psychotherapy and social psychology – it's amazing how many failed the comprehension test. I completely agree with you. I've never joined a book club for the same reasons. I have a massive number of books just waiting to be read. I do not want to spend time reading books that I know I will not enjoy. Since getting a Kindle I have also become a lot more selective about the books I buy. I always download a free sample. If it is well written and has grabbed me by the end of the sample I go on to purchase it or reserve it from the library. If not I feel pleased that I have saved my money. Glad to see some people sharing my views on book clubs. Too much like homework. The chances of a group all wanting to read the same book at the same time are slim. Why don't men seem to like them much I wonder? Have new blogpost on favourite reads. I've been asked to join 2 book clubs but it just seemed to much like school to me! I suppose one good side of them is they are a way of meeting other like minded people and people like them as a social thing. I think we're all looking for cheaper ways of socializing. Barbara, Have you read The Last Storyteller: A Novel of Ireland by Frank Delaney? It just came out, and I was privileged to get an ARC from the publisher. It is such a brilliant book, set in Ireland in the 1950's.